Almost two months have passed since that scorching summer day of the general election, and almost forty days since I was designated Prime Minister and a new Cabinet was inaugurated based on a policy agreement of the three-party coalition consisting of the Democratic Party of Japan, the Social Democratic Party, and the People's New Party. In the general election, the people of Japan chose to have a change of government. It is the first time for this to occur materially since democracy took root in Japan. I believe that this change of power was brought about by the voices of the public urging something should be done to fix Japanese politics of today, including the cosy relationship of mutual support among politicians and bureaucrats which had continued for many years, politics that failed to function as a result of the fetters and vested interests, concerns over pensions and medical care, and anxiety over the future. In that sense, the victors in that summertime election were each Japanese citizen. We will undertake a transformation of national politics with the enthusiasm that now is the time to change Japanese history, in order to live up to each citizen's strong wishes and impassioned expectations. Since election day, we have been working very hard to set up a new government and the framework of a new form of politics. In the process I felt very strongly the public's expectations for change on the one hand, but, on the other, that people also still harbour sentiments of doubt, wondering whether any true change can be brought about, and of resignation, that the government will never change, or that even if it does, people's daily lives will not. I regard the distrust of politics and the feelings of resignation spreading among the people until now as not necessarily the responsibility of the former ruling parties alone. I believe that we who were in the opposition must also realise our own responsibility and work to resolve these issues. Recall the sweltering days of summer when we summoned all our strength to do battle in the election. Recall the voices you heard directly from the people in towns and villages, on main street and on small back streets, up in the mountains and down by the sea, in schools and in hospitals all around the country. Honourable representatives, let us reflect on the public's wishes we now harbour in our minds and together let us unwaveringly bring them to fruition. Let us engage in hearty debate here at the Diet that is not for the party, nor for politicians, and of course not for any election, but truly for the people, to the utmost extent of our ability. The crux of change is to start now. Let's make today the day of a new departure. In order to recover public trust in politics and government, I consider it essential for us to rectify government waste and conventions and for politicians to take the lead in getting down to hard work. For this reason, the Hatoyama Cabinet has done away with the structure of government within which politicians depend on the bureaucracy. We are instead working to turn this structure around 180 degrees to a new type of politics, politics of political leadership and popular sovereignty. Decision-taking at government ministries and agencies will not involve bureaucrats but will rather be done by the "council of the three political-level appointees" consisting of the minister, senior vice minister, and parliamentary secretary. Decision-taking by the entire government has been unified under the Cabinet. We have also abolished the meetings of administrative vice-ministers and other bureaucrats so that it is politicians backed by a popular mandate that coordinate and take decisions on policies through their own initiative. On important policy matters, relevant Cabinet committees will draw final conclusions after having conducted exhaustive debate. Under this new structure, the first thing we must do is a full-scale cleanup of the postwar government. There are two aspects in particular demanding substantial change. The first of these is a full-scale cleanup of organisations and operations. The Government Revitalisation Unit which I chair will undertake a review of all government budgets, operations and projects and also the modalities of regulation. We will thoroughly eliminate the wasteful use of taxpayers' money and expose to the public the existence of any secret internal governmental agreements or memoranda among government ministries and agencies. As a result of a review of the supplementary budget for the current fiscal year [that was being implemented by the previous government], we have already succeeded in halting projects which are either unnecessary or not urgent whose aggregate cost was to have been approximately three trillion yen in scale. This three trillion yen, as important funds entrusted to us by the public, will be reallocated to uses which help the people go about their daily lives and contribute to economic recovery. We will henceforth continue exhaustively to search out wasteful use of tax monies. Regarding projects which in our eyes do not pass muster, we will wipe out the fetters and vested interests that have become ingrained into even the innermost recesses of the government by frankly explaining the situation to the public. In addition, we will review the legal system characterized by centralised authority and the "convoy system" approach that came about in the era of sustained high rates of growth and fundamentally transform it into a legal system grounded in local sovereignty. In addition, we will totally prohibit the practices of amakudari (golden parachuting, i.e. placement of civil servants in post-retirement jobs with entities their former government ministries supervise) and watari (movement between such jobs) among national civil servants and advance sweeping reforms of the national civil service system, including addressing the issue of the fundamental labour rights of civil servants [which are presently restricted]. We will proactively implement the public disclosure and provision of administrative information and share information with the public. We will also promote open decision-taking on public policy through the participation of the public by soliciting policy proposals from them. The other area for a full-scale cleanup is conducting an exhaustive review of the way tax monies are used and budgets are formulated. Taking the perspective of what is in the best interests of both the people of Japan and the entire world, we must eliminate the barriers between vertically-segmented public administration and strategically devise the broad framework of tax and fiscal policy and the fundamental principles in managing the economy. We must undertake a top-down formulation of the budget in a manner that is clearly visible to the public and which looks at multiple fiscal years. At the same time we must substantially reform the budget formulation and execution processes so that projects are implemented in a way that enables us fully to explain to taxpayers regarding each budgeted project what kinds of policy goals have been established and how these goals were ultimately achieved. We have already switched our thinking on large-scale public works such as dams and roads, airports and seaports, whose construction had until now been presumed to proceed, to starting again by reassessing whether they are truly needed by the people. In the future, a fundamental review of fiscal policy will be undertaken at the National Policy Unit under the auspices of Deputy Prime Minister Naoto Kan and myself. In a format consistent with the principle of shifting the focus of spending "from concrete to people", we will transform the structure of fiscal policy, which has become rigid. After clarifying the desirable form for public finances in order to safeguard the daily lives of the people, we will examine paths to rebuilding public finances that adopt a broad and long-term perspective. Politics must also regain public trust. Each politician must sincerely take to heart the public's criticisms concerning political funds and ensure he or she is acting with propriety and transparency as a matter of course. Each must also strive to conduct politics that has fundamentally done away with all fetters and vested interests. I apologise sincerely for the fact that issues surrounding my own political funds have brought distrust to politics and troubled the Japanese people. I will cooperate fully in the ongoing investigation so as to recover trust in politics. During the election campaign this past summer I was among those who visited communities across the length and breadth of the Japanese archipelago and heard many citizens express both their expectations and anguish. When I went to Aomori Prefecture to speak to voters there, I shook hands with a large number of people, but there was one lady who would not let go of my hand. The lady disconsolately described to me her grief at how her son had been unable to find a job and had no option but to take his own life. We politicians, myself included, have not always been sufficiently aware of the fact that more than 30,000 people end their lives each year in despair. The touch of that lady's hands and the sadness in her eyes are things I shall never, and must never forget. There is no end to the number of people who take their own lives because they cannot find in society even a humble place to which they belong, and yet politics and government are thoroughly insensitive to this fact. My primary mission is to rectify this aberrant situation and to revive the Japanese tradition of mutual support in a manner that is appropriate for the modern age. In the past, many politicians used to declare that "politics exists for the weak". Before we talk about big government or small government, we must ensure that the perspectives of the disadvantaged in society and minorities are respected in politics. I declare here today before all else that this idea is the origin of my politics of yu-ai [fraternity]. The result of the recent election is a stinging criticism of politics and government that have consistently neglected the most important things such as this. I have renewed my conviction that we must humbly listen to this criticism and make sincere efforts to address it. To create a nation of "popular sovereignty" in its true sense, what is needed above all is politics that treasures human life and protects people's daily lives. In the past, the driving force behind rapid economic growth was people's earnest desire to escape from poverty, protect their livelihoods and their families and achieve a more stable life. However, around fifty years since the introduction of universal pensions and health insurance, people's peace of mind in their daily lives and sense of security in their future are now being shaken strongly. We must swiftly redress this situation. With regard to pensions, we will make an intensive effort over the next two years to address the pension records problem as a "national project", doing our utmost to restore people's confidence as soon as possible. We will also make steady efforts towards the establishment of an equitable and transparent new pension system that provides people with peace of mind for the future. It is of course important to ensure the accuracy of the system, but we will also aim to carry out reforms for a new era so that the system has the flexibility to cope with people's diversifying lifestyles and so that errors which occur shall be corrected without concealment. We will also do our utmost concerning medical and nursing care. All possible action will of course be taken to prepare fully for and counter new types of influenza. We will change the policy pursued so far of single-mindedly containing medical and nursing care outlays purely from the perspective of fiscal rectitude and set about building a system that can supply high-quality medical services on an efficient and stable basis. As well as securing fine human resources, we must rebuild the system of providing medical care in such areas as regional medical care, emergency care, obstetrics and paediatrics. We will consider a new system so as to abolish and replace the Long Life Health Care System [health care system for the elderly aged 75 and above, introduced in April 2008] which discriminates against the elderly on the basis of age. Child-rearing and education are no longer simply personal concerns. We need to view them as investments in the future, whose cost is borne by all members of society in a mutually supportive manner. A humane society is rightly one where the entire society comes together to support its weaker members, including children and the elderly. Let us aim to build a country in which families do not have to give up having and rearing children for economic reasons, in which people do not have to give up their jobs for child-rearing or nursing care, and in which all those who harbour aspirations can receive high-quality education. To this end, my government shall establish a child allowance, make public high school tuition effectively free and expand scholarships on a major scale, while securing the requisite fiscal resources. We will revive the additional living support allowance paid to single-mother households by the end of this year and advance study on the prompt repeal of the Services and Supports for Persons with Disabilities Act. Furthermore, the politics of fraternity that I am promoting aims to create a society in which everyone can play a role without discrimination or prejudice; this will mean promoting gender equality in all aspects of life, including employment and child-rearing. It also seeks to promote cultural diversity to enable everyone to live with dignity, such as by respecting the history and culture of the Ainu people, who are indigenous to Japan. 3. A Society in Which Each Person Can Discover a "Place He or She Belongs" and a "Role to Play", and a "Japanese Society Whose Members Offer Mutual Support"
I shall touch on the opportunity I had recently to visit a chalk factory. In autumn 1959 the founder and president of the company provisionally hired two graduates of a nearby school for the disabled upon the request of a teacher of that school. The two worked diligently every day, not stopping even when the lunchtime bell sounded. One day, their female colleagues pleaded with the president, saying, "They're like our daughters. We promise to look after them, so please hire them on a full-time basis". The company decided to hire graduates of the school the following year and the year after that as well. At a gathering attended by the president one year, he posed a question to the head priest of a Buddhist temple who happened to sit next to him. "The workers at my factory can't read letters or numbers, and they would no doubt be much happier in an institution for the disabled. Why then, I wonder, do they work so hard, commuting on crowded trains and reporting to work on time every day?" The priest replied, "Do you think material possessions and money are what make people happy? There are four things that lead to ultimate happiness. Being loved, being praised, being of service to others, and being needed. Through work they can gain three of the four except love". Personal experience has shown, the company president reports, that it is possible to gain love as well through hard work. At this chalk factory, seventy percent of employees are "challenged" with some kind of disability. But it is nonetheless one of the country's leading makers of dustless chalk, whose particles are less likely to float in the air. This anecdote demonstrates that people feel happiness when they are praised, appreciated and needed, and those with disabilities, senior citizens and patients with intractable diseases are no exception. Albert Einstein, whom I greatly respect, once commented, "We are here for the sake of each other, above all, for those upon whose smile and well-being our own happiness depends, and also, for the countless unknown souls with whose fate we are connected by a bond of sympathy". Over the past ten or so years, the regions in Japan have become rapidly impoverished. By this I am referring not just to economic decline or growing disparities but to the fact that the local bonds which hitherto supported Japanese society are being torn apart. Nostalgia alone will not be enough, however, to revive regional communities. Regional communities, bound by the bonds of the land and of the blood through which "everyone knows everyone else" are on the verge of disappearing. Our next aim, therefore, should not be simply to revive communities of the past but should be to seek out a new type of community. By taking advantage of sports or artistic and cultural activities, child-rearing, nursing care and other volunteer work, the environmental protection movement, regional disaster prevention initiatives, linkages through the Internet and other means, attempts should be made to re-knit networks of trust among residents so that at least "everyone knows someone". This can lead to the formation of new bonds within society built on the sharing of values, such as the awareness that the seemingly cranky old man actually has a wonderful smile when working as a volunteer or that the taciturn Brazilian resident is really kind-hearted and is very good at teaching football to children. Fortunately, in locations throughout Japan there is a growing movement centred on citizens and non-profit organisations (NPOs) to resolve everyday issues like those relating to child-rearing, nursing care, education, and community-building on their own. There are people who support young parents--who tend to become isolated with child-rearing concerns--by hosting community classes so that parents can openly share their experiences and have a place where they belong. Among the parents who receive such support are some who go on to participate in activities to support others, thereby finding a new "role to play" in society which takes advantage of their own experiences. Working and earning a livelihood are not easy tasks. But at the same time, supporting others through work and being of service to others can be a source of great joy. What I am seeking is a "new public commons", under which people support and are of service to each other. It consists of a new set of values that sees the supporting role being played not just by people in the bureaucracy but also by each person in local communities who is involved in such activities as education or child-rearing, community-building, crime and disaster prevention, medical care and welfare. Such efforts ought to be supported by society as a whole. The role of politics may not be very large at the level of people's daily lives. In fact, the only role politics can play may be to remove those excessive regulations that hinder the launching of initiatives among citizens and NPOs or do little else but increase the workload and budgets of government offices. I believe, though, that lending such indirect support to civic and NPO activities is exactly the role that politics should play in the twenty-first century. Building a new nation is certainly not a matter that can be consigned to others. Neither can all problems be resolved merely through political or administrative efforts to increase the budget. Only by having each individual citizen foster and develop the ideal of self-support and co-existence can we revive the bonds within society and recover the relationships of trust among people. I will stand at the forefront of the efforts by the nation, local authorities and people to come together as one, dedicating all my strength to bringing about a "Japanese society whose members offer mutual support" in which all people recognise the existence of all other people as invaluable and in which each person can discover a "place he or she belongs" and his or her own "role to play". It is self-evident that free economic activity in the market generates social dynamism and enriches people's lives. It is also clear, however, that some ideas are no longer valid--such as that we should leave everything to market forces so that only the strong survive, or that we should pursue economic rationalism even at the expense of people's daily lives. I wish to propose a change to "an economy for the people." This means ceasing to gauge the economy through yardsticks that give too much weight to economic rationalism and growth rates. While promoting free competition in economic activity, we must switch to an economy and society which give greater emphasis to the quality of people's lives by preparing adequate safety nets with regard to employment and human resources development, by ensuring food safety and public safety and by adopting the consumers' perspective. The recent financial and economic crisis has had a grave impact on economic activity and on employment, and even today the situation remains precarious. I have personally met people from small and medium-sized enterprises (SMEs) in regions all over the country and heard first-hand how they are clenching their teeth and desperately doing everything possible to keep going amidst the impoverishment of local economies and the rough waves of the economic crisis. People like them represent the real strength of the Japanese economy, and politics has a duty to protect them. 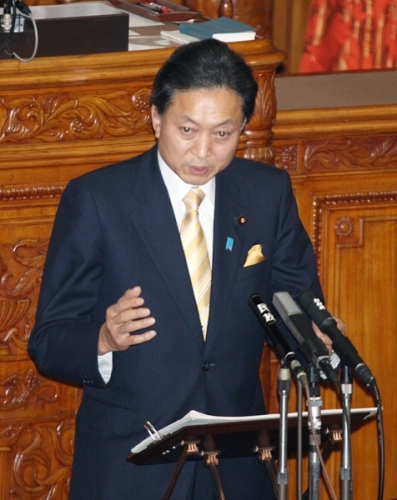 The most important challenges of the Hatoyama Cabinet are: (1) to put the Japanese economy on a recovery track which is driven by autonomous private-sector demand, while paying careful attention to economic trends and addressing such issues as the further deterioration of the employment situation, stagnant consumption and the severe difficulties faced by local economies and cash-strapped SMEs; and (2) to ensure sustainable growth while heeding the need for international policy coordination. We will submit to this Diet session a bill to rectify the practice among financial institutions of denying or forcibly recalling loans to SMEs. In addition, in order to ensure that the entire government addresses the employment situation in a cohesive manner, the government has set up a Headquarters for Emergency Employment Measures and has adopted a carefully-considered and flexible programme of emergency employment measures. These measures include assistance to people who have lost their jobs and are struggling to make ends meet, action to address the needs of new graduates who have not yet found employment, consideration for SMEs and full-scale measures to create employment. It is at times like these, I believe, that society as a whole, including local governments, private companies, labour unions and non-profit organisations, should make efforts to secure employment in a spirit of mutual support. We will dispel the public's vague sense of anxiety about the future stemming from their distrust of the social security system including the systems of pensions, medical care and nursing care. We will also provide direct support for household finances by establishing a child allowance, abolishing the provisional rates of taxes on petrol and eliminating in principle motorway tolls. Through these measures, we will make the change to "an economy for the people", in which people can live with peace of mind. We aim to provide both material and psychological encouragement on the expansion of personal consumption. It is also vital that we achieve stable growth which is mainly driven by on domestic demand. We will lead the world through our strengths in science and technology, such as by fostering the world's best low carbon-type industries or "green industries" as pillars of growth, promoting the use of information and communications technology in all areas of people's lives and strengthening research and development and human resources development in cutting-edge fields. We will also thoroughly re-examine the manner of regulation in these areas so as to create a new demand cycle. Moreover, based on the fundamental principle of shifting the focus of spending "from concrete to people", we will change our industrial structure which is dependent on public works. We will foster sound industries and create new jobs and demand in such fields as: medical and nursing care which provide peace of mind in daily life; child-rearing and education which are investments for the future; and agriculture, forestry and tourism which sustain regional communities. Further, we will strategically put in place the infrastructure that is truly needed to make Japan's airports and ports international hub facilities of the world and of Asia, such as by making Haneda Airport an international hub airport operating twenty-four hours a day. Through growth industries in the environment and other fields, we will also provide a powerful boost to Asia's growth, promoting dynamic development in the whole of Asia including Japan. In order to bring about "an economy for the people," I will boldly implement reforms to establish "regional sovereignty" so as to create vibrant local communities where decisions on regional matters are taken by the local residents. The size of the budget to be spent on specific policies and the future vision of regions to be pursued as a result are matters which ought to be considered and decided by the local residents themselves. Instead of creating a uniform, centralised state, by minimising the binding rules imposed by the national government, we will do our utmost to create a new nation in which hard-working residents can become the protagonists of their own communities. As the first step in this task, we will work to expand and enhance the independent revenue sources of local governments. We must change the relationship between the national and regional governments. This will entail a fundamental shift from the present hierarchical relationship, in which the central government stands above regional ones, to a new partnership which allows dialogue among equal parties. At the same time, we must provide the forum for such equal dialogue between the national and regional governments with a legal basis. Beneath these reforms lies a new concept of local autonomy, under which all the inhabitants of regional communities assume responsibility for the future of the towns and villages in which they live. At the same time, the national government will willingly play the roles it should in order to create vibrant local communities. We will revive agriculture, forestry and fisheries, such as by establishing an individual household income support system. We will also thoroughly re-examine postal service operations so as to position the network of post offices in the regions as a base for ensuring convenience in daily life and revitalising regional communities. 5. Japan As a "Bridge"
Japan is a country that is blessed with experience and strengths in not only the economic field but also in a broad range of areas, spanning the environment, peace, culture, and science and technology, among others. �@As I stated at the United Nations General Assembly, that is why it is Japan that must rise up to overcome global challenges including climate change, nuclear proliferation, as well as poverty issues in Africa and elsewhere, and become a "bridge" linking east and west, developed and developing countries, and diverse cultures. It is in actively carrying out such roles that we will become a country whose citizens in their entirety can hold high hopes and pride in being Japanese. This should also serve as the first step in Japan becoming a country that enjoys the trust of the international community as a "bridge" serving the world. The world now faces the issue of climate change, a threat that concerns the survival of humankind. We are working to confront the enormous menace of climate change in the run-up to COP15 to be held in Copenhagen in December, but tackling it is no easy task. Nevertheless, I firmly believe that Japan, a country with meagre natural resources, can certainly open a path towards the resolution of this issue by being a lead runner of the world, by further upgrading the technologies it has cultivated thus far in overcoming the oil crises and pollution problems. Moreover, our history bears out that such efforts will at the same time present us with tremendous opportunities for the Japanese economy. I will play a leading role in international negotiations, having set a Japanese target of reducing greenhouse gas emissions by 25 percent by 2020 compared to the 1990 level; this target is premised on the creation of a fair and effective international framework which includes all major economies and an agreement on ambitious targets by each of them. In addition, by implementing the "Hatoyama Initiative" for assisting developing countries, Japan will actively serve as a bridge that links developed and developing nations and shall contribute at the global level to making the environment and economy compatible as well as shifting to a low-carbon society. To achieve this goal, I will promote actions to conserve the environment of the world and of Japan and pass them down to the children of tomorrow under an initiative to be known as "Challenge 25". I will exert my political leadership to mobilise all possible policy tools to advance this initiative together with the Japanese people. There is no issue as serious for human survival as the existence of nuclear weapons or nuclear proliferation. I am deeply sympathetic to the proposal for "a world without nuclear weapons" courageously put forward by President Obama, and I support it wholeheartedly. However, this does not mean that the United States alone bears responsibility for the elimination of nuclear weapons. Instead, all nations are called upon to become conscious of their own responsibilities and take action. No nation can appeal to the world for "a world without nuclear weapons" as persuasively as Japan, which has advocated the elimination of nuclear weapons as the only country to have ever suffered the devastation of atomic bombings and which has staunchly upheld the "Three Non-Nuclear Principles". With unwavering resolve I will advance efforts as a "bridge" of the world which contributes significantly to nuclear disarmament and nuclear non-proliferation and enables countries to take the important step towards bequeathing "a world without nuclear weapons" to the children of the future. Japan is also a maritime state situated in the Asia-Pacific region. The rich Japanese culture has since ancient times been nurtured through exchanges and trade with foreign countries. The seas surrounding Japan must never again be made into seas of conflict. It is important that we should continue our efforts to maintain these waters as fruitful seas of friendship and solidarity. I consider this to be in the interest of not only Japan but also the Asia-Pacific region and indeed, the entire world. The foundation for this will be a close and equal Japan-US alliance. This "equal" relationship is one in which the Japanese side too can actively make proposals and cooperate on the role that the Japan-US alliance can play for the sake of global peace and security and on concrete guidelines for action. I will deepen the multi-layered Japan-US alliance in which Japan and the US coordinate and cooperate with each other, not just on bilateral matters but also for the peace and prosperity of the Asia-Pacific region and in order to overcome global challenges including climate change and the creation of a world without nuclear weapons. Within this relationship of trust, we will also frankly discuss with each other the outstanding issues between the two countries. In particular, I will earnestly address the subject of the realignment of US forces in Japan. In so doing, security considerations will be taken fully into account, and the history of Japan-US agreements and other circumstances will be carefully examined. In addition, the burdens, the suffering, and the sorrow borne by the people of Okinawa will be fully kept in mind, and the feelings of the local people will be sincerely taken to heart. Assistance to Afghanistan and Pakistan ranks among the most critical issues with which the international community now contends. In particular, Afghanistan is currently grappling with the threat of terrorism while also aiming for national reconstruction and the peace and stability of its society. After examining what form of assistance is truly necessary, Japan will extend active assistance in the areas and through the means in which it excels, such as agricultural assistance, vocational training for former combatants and the reinforcement of police functions. In this connection, where the replenishment support activities being conducted in the Indian Ocean are concerned, we will not proceed with a simple extension of these activities [beyond January 2010] but will take a decision in the larger context of assistance to Afghanistan. Japan will address the issues surrounding North Korea in close cooperation with other relevant countries in order to bring about a comprehensive resolution of all outstanding issues including the abduction, nuclear, and missile issues and in turn the normalisation of diplomatic relations based on such a resolution. Regarding the nuclear issue, we will continue efforts to achieve denuclearisation through the Six-Party Talks as we rigourously implement measures based on successive United Nations Security Council resolutions. I will also seek to resolve the abduction issue at the earliest possible date using all conceivable means. As for Japan-Russia relations, while advancing the political and economic aspects of the relationship as two wheels on the same axle, I will vigourously work to pursue a final settlement of the Northern Territories issue, the foremost outstanding issue in Japan-Russia relations, and to conclude a peace treaty. We will also strengthen our cooperative relationship, viewing Russia as a partner in the Asia-Pacific region. I have in recent days been engaged in a series of frank and sincere exchanges of views with the leaders of Asian countries. With regard to Japan's relations with neighbouring countries such as the Republic of Korea, China, and the countries of Southeast Asia, we will build up relationships of real trust and advance cooperation by actively seeking out the points we share in common and areas where we can cooperate while mutually respecting diverse values. The Asia-Pacific region has throughout its long history been continually beset by a large number of earthquakes, floods, and other natural disasters. Recently in response to the disaster caused by an earthquake off the coast of Sumatra, Japan's international disaster relief team arrived at the affected site earlier than other teams and contributed to the rescue operations and medical activities. I believe that in the future, it will become even more necessary to harness for the entire region Japan's world-leading disaster prevention technologies and knowledge and experience in disaster relief and reconstruction, as well as our extremely active volunteer network on disaster prevention and disaster countermeasures. The East Asia region still faces significant challenges in the areas of health and sanitation. In addition, the reinforcement of countermeasures against new infectious diseases including novel influenza A (H1N1) and other diseases has become a matter of urgency. The role for Japan to play is extremely important in this area as well, utilising for example contributions from Japan's social system as a whole, including its medical technologies and its health centres. It is also important to step up cooperation and exchanges in the field of culture. Despite its mix of diverse cultures, East Asian countries enjoy a wealth of points in common, both historically and culturally. It is unnecessary for me to reiterate the degree to which a mutual deepening of understanding and affinity for others' cultures at the grass-roots level fosters relationships of trust among countries. This is the case even though arduous political or economic negotiations may be conducted, and despite the differences in our ideologies and our political systems that may exist. I believe that in the years to come, making cultural exchange activities among our citizens more active and deepening exchanges in the areas of educational, cultural, volunteer, and other transnational activities, particularly among the youth of the next generation, will prove very effective in order to intensify mutual relationships of trust within the East Asia region. I thus intend to take various steps including the siginificant expansion of both the hosting of international students in Japan and the number of Japanese studying abroad, greatly increasing the number of specialists in the various languages and cultures of the region, and also enhancing the system for interchangeably transferring university credits earned in Japan, China, and the Republic of Korea. It is with a view to the long term that I will undertake these initiatives to foster the human resources who will sustain East Asian and Asia-Pacific cooperation thirty years hence. Beyond the fields of trade and economic partnerships, economic cooperation and the environment, as I have stated, I intend to amplify and enrich cooperation in the area of "people's lives and culture" as part of "an economy for the people" and promote the concept of an East Asian community as a highly transparent cooperative entity which is open to other regions. We live on the Japanese islands which are said to be an archipelago of earthquakes and natural disasters. The first task of political leadership is to make full-scale preparations for times when major natural disasters strike Japan. Moreover, at the same time I wish to create a Japan that is loved and trusted by the people of other countries as well as a Japan brimming with such appeal that when a disaster does strike, people from all over the world and particularly people from neighbouring Asian countries hasten to Japan in the spirit of yu-ai, or "fraternity", wanting somehow to rescue Japan, help the people living in Japan, and protect Japanese culture. This is my honest wish. Japan is a country that 140 years ago achieved the drastic reforms of the Meiji Reformation. Now, the undertakings of the Hatoyama government are a "bloodless Heisei Reformation", so to speak. The current Reformation restores sovereign power to the people, breaking from a system dependent on the bureaucracy. It is also an attempt to transform the very shape of our nation from a centralised state to one of regional and local sovereignty, and from an insular island to an open maritime state. The new nation-building is not something that will be done for us by others. Present-day Japan faces neither the external pressure of Black Ships nor vast stretches of burnt-out ruins following defeat in war. Decisively pushing through these reforms against such a backdrop represents a comparable if not greater challenge to the trials and tribulations undergone by our Meiji predecessors. We may stumble along the way. We may even hit our head against an obstacle. Nevertheless, I am resolved to create a strong government with lofty ideals, on which future historians will reflect as "having carried out, towards the end of the first decade of the twenty-first century, reforms which looked ahead at the Japan of thirty to fifty years into the future". We can achieve this if we start now. Will the Japan that has until now pursued numerical growth follow a path from maturation to decline under the same ideas of yesteryear, or will it instead find a path to novel breakthroughs and enrichment beyond this maturation, drawing on a fresh spirit of volition and intellectual power to formulate initiatives? We now stand at just such a crossroads. To enable Japan to walk down the right path, I will stand at the fore, pushing forward novel policies designed to protect the daily lives of the Japanese people. I will attain the public's active participation in politics and government and together with the people I will devote my utmost efforts to changing history in the true sense and leading Japan to a dramatic leap higher. I urge you my fellow citizens and you my fellow Diet members to lend your support to the challenge of this transformation we are undertaking. Let us together create a new Japan!